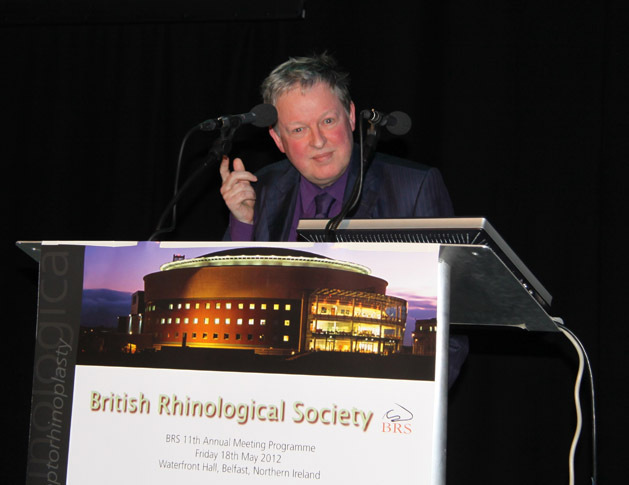 Belfast was host to the 2012 British Rhinological Society meeting, courtesy of Geraldine Gallagher. There was no shortage of people willing to make the trip across the Irish Sea to attend and those who did were not disappointed. The President's Address prefaced the free-paper session in which Sally Erskine gave the prize-winning talk. Attendees were then privileged to hear an oration from Prof Andreas Leunig from Munich - one of the most highly acclaimed teachers of Endoscopic Sinus Surgery on the circuit. Prof Leunig informed the meeting about his experience teaching on ESS courses and the present tools and technologies that are available to assist both teacher and pupil on such courses, including an extremely real-looking sinonasal model simulator which can even simulate torrential carotid bleeds in the sphenoid and as such is almost certainly going to become the biohazard-free alternative to cadaveric dissection for teaching in the future. Prof Leunig also presented results from a multicenter study he has conducted along with other prominent rhinological colleagues looking at candidates' experiences when attending FESS courses. The morning was rounded off by Paul with his (loosely) rhinological-based quiz which gets more obscure every year, but more interesting and enlightening for it. We now all now that certain historical figures had their nasion surgically deepened because they feared assassination attempts from his blind side. After lunch we heard from Anshul Sama about the limitations of the endoscopic approach to the frontal sinus, from Maurice Hawthorne about medicolegal pitfalls in rhinological practice, from Robin Adair about paediatric rhinology services and from Showkat Mirza about Payment by Results and HRG coding with particular respect to rhinology. The Consultant Interesting Cases then followed and certainly lived up to its title - it's always nice to hear learning points from other people's nightmare cases. The annual general meeting closed the day and we learned that there had been a number of changes to Council, with new national representatives replacing the existing regional ones. This was the last BRS meeting to be presided over by Andrew Swift and Paul White will soon take over the reins as Society President. There was also a change in the Treasury with out-going treasurer Sean Carrie handing over to Raj Bhalla. 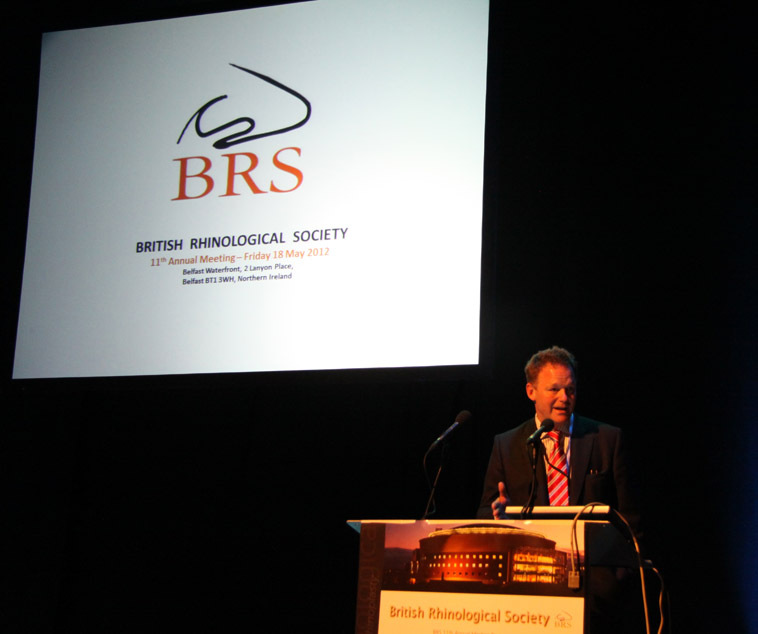 As attention now turns to Newcastle-upon-Tyne where Sean Carrie will host the 2013 meeting, it is quite apparent that the BRS meeting continues to be an important date in the diary of so many rhinologists and continues to put on relevant and varied programmes year after year. 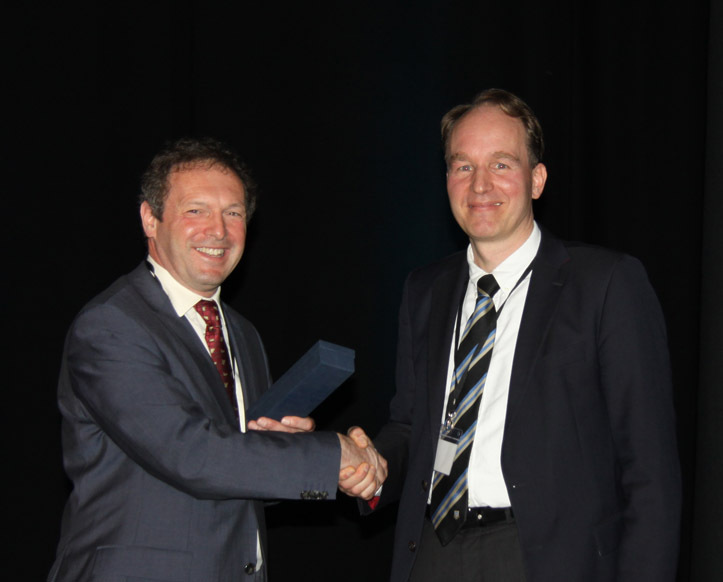 BRS President Mr Andrew Swift presents Storz lecturer Professor Andreas Leunig with a gift from the Society.